Yas Marina Circuit today announced that an array of ticket options for international fans are on sale for what will be its biggest race weekend ever. 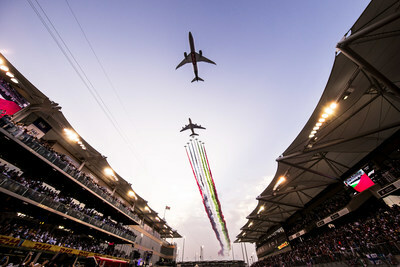 The season-ending FORMULA 1 ETIHAD AIRWAYS ABU DHABI GRAND PRIX 2019 will run from Wednesday 27 November to Monday 2 December - offering five whole days of on-track and off-track entertainment, and with the fastest ever cars seen in F1, promises to be a spectacular finale. #AbuDhabiGP 2019 will see the introduction of all-new ticket packages available to the range of international race goers, providing something for everyone and choices to suit all budgets - all providing superb value. For information on bespoke travel packages, please visit Yas Island's experiencehub.com. Visitors can choose from all-new Grandstand packages with premium seating, plus improved hospitality options that include 1-day Paddock Club(TM) access. The family-friendly 'Super Parks Pass' package will also return in 2019 and this year has been extended from Wednesday to Sunday, allowing unlimited access to all three Yas Island Parks - Ferrari World Abu Dhabi, Yas Waterworld and Warner Bros. World(TM) Abu Dhabi. Al Tareq Al Ameri, CEO of Yas Marina Circuit, said: "We have seen international visitation increasing every year. We are one of the most internationally visited Grands Prix, thanks to our efforts to entertain and excite consumers with a strong destination story as well as our 'modern definition of F1' positioning. Tickets are available online at http://www.yasmarinacircuit.com.